Certainly Copan isn’t the as grand a city as many of the other major Mayan ruins in Central America. In comparison with Tikal the ruins at Copan are but a village, but there is something very unique about this set of ruins in Western Honduras: faces. Throughout the ruins you’ll see a number of faces carved into the stones, homage to the kings that once ruled over this great city. These faces give us great insight into the past that we can otherwise only dream about. This is my entry to #frifotos this week: “Copan Face.” Enjoy. I always feel like you should photograph statues of people the exact same way that you photograph people. You see far too many people try to squeeze out the entire statue which essentially makes the image look like a snapshot. When I got to this particular statue in Copan I knew how to photograph it, I just didn’t know which angle I would take; I settled on the profile since I felt that it was the most powerful. Technically, you really have to understand depth of field to take shots of people, and statues of people. I wanted the background of this image out of focus as not to draw away the attention of the viewer to something else in the frame. However, I wanted to get the whole face in focus. If I shoot this with too wide an aperture, say f/4, too much of the statue is out of focus. If I shoot it too narrow, say f/9, then the backgroud will be too busy, and the shot likely will be less sharp as well since the shutter speed would be slower. 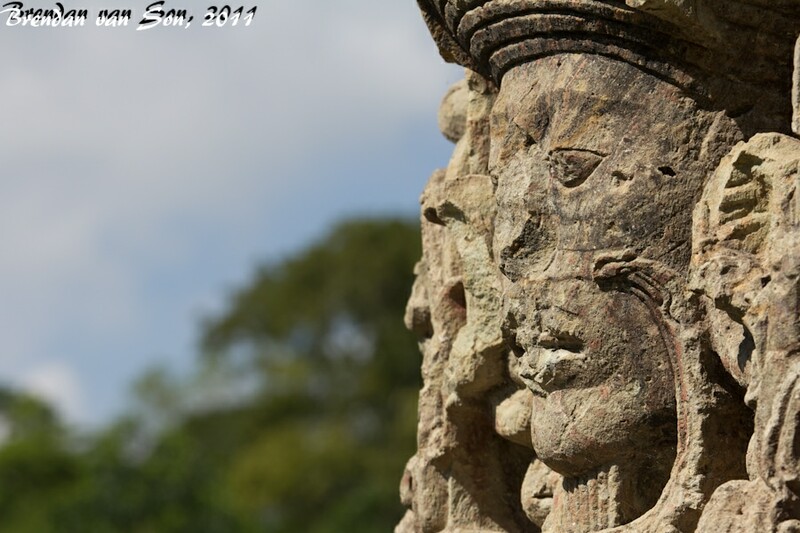 For the photographers, I shot “Copan Face” on my Canon 60d with a 70-200mm f/4. The focal length was at 127mm, f/5.6, shutter speed was 1/640, and the ISO was at 100. In additional to what you’ve mentioned, uou use the rule of thirds well here in this photo. This to me is a perfect illustration of why I could never go back to using a point and shoot camera – the ability to manipulate DOF.